This is the first of a weeklong blog post extravaganza. I will be posting a ceramic tip as well as a ceramic lesson with student examples each day. Stay tuned for more ceramic management tips and lessons! Since I have at least four different grade levels working on ceramics at the same time, and because I have sculptures in multiple different stages in the firing process, and because I only have one kiln for over 800 students, it is important to me to always load the kiln to the brim and fire as many sculptures at a time as possible. I only use white earthenware clay that can be fired at cone 05-06. 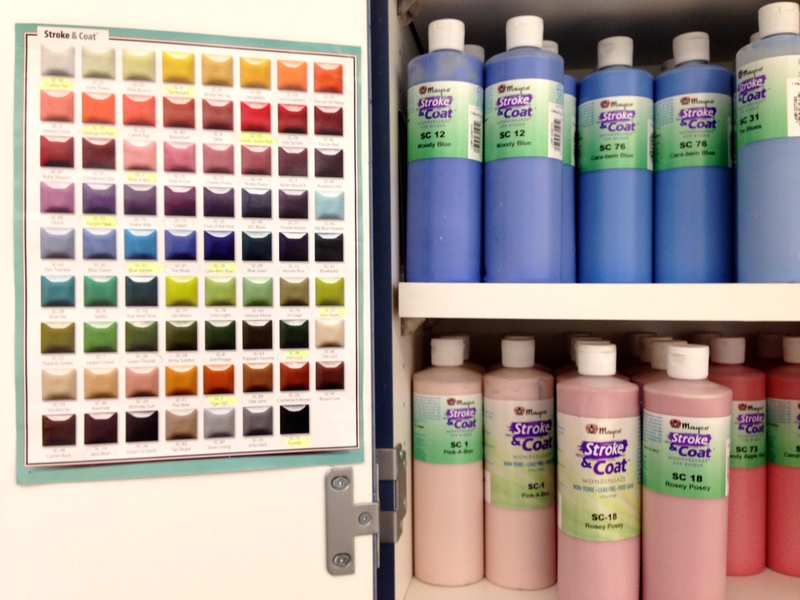 I use Mayco Stroke & Coat glazes, which can be fired at cone 06-10. If I have greenware and glazed pieces that need to be fired at the same time, I load them all into the kiln together, then fire at standard speed at cone 06. This way, I don’t have to keep different stages/classes separate and I can make the most of every firing. I don’t know if there is any methodology or reasoning against doing this, and in the past 7 years I have never had a problem doing so. As long as my greenware is completely dry, and I fire at standard speed, everything comes out just as it does when fired separately. This may all seem very obvious to some of you, but when I first started teaching I had no ceramic sculpture or kiln firing experience. The first year I only ever fired things at their individual stages for fear that if I mixed and matched something would turn out terribly. At my first school I did not have an automatic kiln and I had to fire greenware very slowly throughout the day. I fired glassware much more quickly. Now that I have the electric kiln I am able to program it this way and save myself lots of loads and hassle. 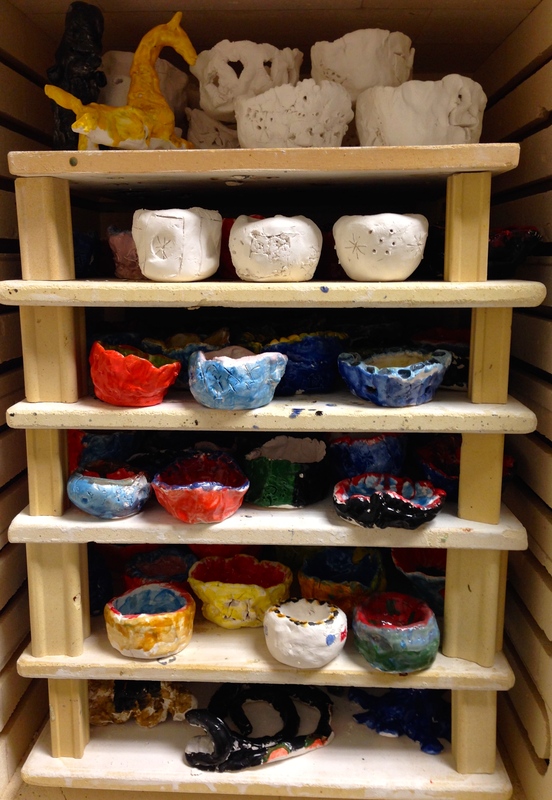 This entry was posted in Art Room, Materials, Organization and tagged art classroom, art room, ceramic, ceramics, classroom management by Sarah DeWitt Brooks. Bookmark the permalink. I’ve done the same thing but had some of the glaze wear shivering(Small cracks as a result of not a good fit of clay/glaze). There was little flakes of glaze popping off. Let just say my kido’s were not eating ice cream out of their coil bowls last year. A big disappointment at the end of the year. I too use Mayco Stroke and coat and it seems crazy that it would have a fit problem with its flexibility to glaze at any stage. I talked with a rep at an art conference from Amaco and she said they have had some bad batches of clay… When I called them I got no word back on my batches. I am in the middle of finishing clay right now… I really hope this doesn’t happen again! I had to place my order before we did clay last year. I don’t think I will be ordering Amaco again this year! What kind of clay do you use? Brand we are always using white earthenware that bisque fires to 04-05.